ISC West, held on April 6 – 8, 2016, drew large crowds to the Tyco Security Products / Exacq booth. The booth was buzzing with activity all three days of the show. Here’s a recap in case you missed the show or want more detail on the new exacqVision products introduced and demoed. At ISC West, we introduced our new exacqVision LC-Series Una network video recorder. Una comes with either 8 or 16 remotely managed PoE+ camera ports built in and pre-licensed exacqVision VMS software, simplifying camera installation and reducing hardware needs. Simply plug in cameras and start recording with exacqVision EasyConnect. Learn more about exacqVision Una. We also offered demonstrations of exacqVision v7.6. This newest version of our video management system software improves client performance, adds a new area zoom feature, provides robust camera mapping tools, and incorporates a second reviewer feature. Learn more about the new video security and surveillance features in exacqVision 7.6. We were also pleased to demonstrate the integration of the exacqVision video security solution with the DSC PowerSeries Neo intrusion security solution and the Kantech EntraPass access control solution. The ability to integrate and control these security solutions from a single interface reduces system complexity and improves the efficiency of the entire security operation. Exacq was presented with the Security Innovation Award from Secured Cities for its Gold winning project in the public safety security sector: How the City of Hollister Successfully Used Technology to Manage a Very Large-Scale Active Event. With exacqVision, the Hollister Police Department revolutionized the management, resource deployment and information delivery to provide security for the 2015 Hollister Bike Rally. The Biker Rally brings tens of thousands of bikers together for a three-day event in a 12-block area. SurveillanceGrid Integration Inc. worked with the Hollister Police Department, the City of Hollister IT Director and City Officials to manage a safe, public event. exacqVision video management system (VMS) software was deployed to three walls of monitors throughout three command centers. exacqVision VMS software acted as a force multiplier to improve coverage and situational awareness. Read more about the success of the project. Exacq received the 2015 Arecont Vision North American Technology Partner of the Year Award during ISC West. exacqVision VMS software provides recording, management and support for more than 315 Arecont Vision IP cameras. Exacq offers a single license for the innovative SurroundVideo and OMNI Series, which has 4 sensors positioned in either a 180 degree or 360 degree configuration or completely user configurable in the case of the OMNI. Together, Arecont Vision and Exacq have thousands of installations in almost every vertical ranging from small to large, enterprise-class locations around the world. Thanks again to those that were able to visit us in our booth at ISC West this year. Please visit our website to learn more about our products. If you didn’t have the opportunity to speak to your local sales representative at ISC West, visit our sales team page and contact us today. 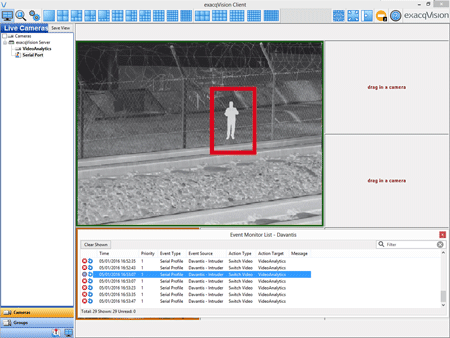 exacqVision is now integrated with Davantis perimeter protection solution. Davantis provides a perimeter protection solution for intrusion, loitering, tampering object removal and stopped vehicle detection. This integration gives users a way to quickly validate video of perimeter detection within one interface. Davantis is certified by United Kingdom’s Home Office as an i-LIDS® approved primary detection system. i-LIDS is the UK Government’s benchmark standard for video analytics technology and is only awarded to products judged to have met the stringent criteria specified by the UK Home Office Scientific Development Branch (HOSBD) for video-based detection system for government use. exacqVision version 7.4 or later with a current exacqVision Professional or Enterprise license along with Davantis software Daview v166 or later. Learn more about this integration with Davantis on our video analytics page. The exacqVision LC-Series hybrid network video recorders now offer enhanced features for greater reliability. Learn more about the exacqVision LC-Series hybrid recorders. If you have questions, contact your local sales representative or call 317.845.8710. 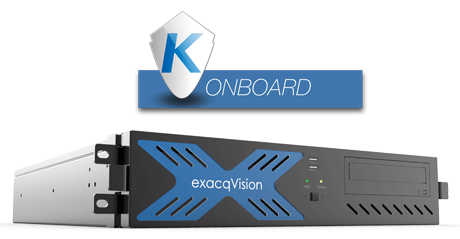 The new exacqVision Kantech onboard recorders introduce exacqVision A-Series and Z-Series Windows network video recorders (NVR) that come pre-loaded and pre-licensed with Kantech EntraPass Corporate access control system at no additional cost. Having the access control system loaded onto the video server saves users hardware, power and cooling costs while also reducing the amount of rack space required. Combining live and recorded video with access control unifies security functions as an all-in-one solution, reducing duplicate efforts and saving time and money. Each exacqVision recorder includes a three-year hardware warranty and three years of exacqVision free software updates. Learn more about exacqVision Kantech onboard. View our commonly asked questions. These recorders will be available to ship starting Monday, February 15. If you have any questions, contact your local sales representative or call 317.845.5710. The exacqVision LC-Series IP network video recorders now offer enhanced features for greater reliability. Learn more about the exacqVision LC-Series IP recorders on our webpage. Watch our new video about the exacqVision 7.2 List Search feature. The new exacqVision 7.2 list search feature gives users another search option in addition to the Timeline and Thumbnail search features. With list search, users can greatly reduce investigation time when reviewing video associated with events, such as point-of-sale transactions, access control, and other data events. List search is available on exacqVision Start, Pro and Enterprise VMS software. The latest version of the exacqVision video management system (VMS), version 7.2 is now available. The exacqVision 7.2 Kantech EntraPass integration provides users with the ability to control doors and locks directly from the live view page of the exacqVision client. Door controls can be associated with cameras using exacqVision Camera Links. This integration puts the most needed access control commands at the operator’s fingertips to vastly improve response time to critical alarms and events. The integration displays door status on maps and allows for configuration of Event Linking actions triggered by EntraPass door status alerts. All exacqVision users can see the door status on linked cameras, but must input Kantech permissions to operate doors. Setup Indicators, available in exacqVision Professional and Enterprise with a current Software Subscription Agreement (SSA), guide installers through common configuration options to optimize their exacqVision configuration. These indicators, available only to Power Users and Admins, provide guidance on configuring motion detection, ensuring network connectivity, changing default passwords and more to ensure no installation steps are missed during configuration. Power Users and Admins have the ability to dismiss all indicators of a certain type, for a specific system or just individual indicators. By double-clicking a setup indicator, the user is taken directly to the associated page to configure. exacqVision Enterprise AD/LDAP has been improved in this release, allowing configuration of multiple servers at one time. AD/LDAP is now supported on exacqVision Edge platforms. In addition, SSL encryption has been simplified and Service Principal Name (SPN) can now be generated from the exacqVision client. Exacq Mobile now includes Push Notifications, allowing users to push notifications to a mobile device when an event occurs, even when the mobile app is closed. Exacq Mobile app users can open the event in the triggered state from the notification. In addition, the web client now supports native H.264 video encoding. This reduces the transcoding load on web servers, increasing server capacity. In Enterprise System Manager, administrators can prioritize events in order of importance. The ESM rules engine can now be used to create alerts. Alerts can be promoted to display only the most important events in the dashboard for quicker monitoring and more effective security management. We have added support for more than 65 new IP camera models in the exacqVision 7.2 release and updated over 325 test records. exacqVision now supports nearly 3,000 IP cameras. Added Illustra 825 fisheye dewarping enhancements to the zoom levels. Aspect ratios will always be 4:3 when dewarped. The new exacqVision Z-Series IP network video recorders (NVR) now have 50% more maximum storage capacity. These Z-Series NVRs offer the highest performance, reliability and capacity for the most demanding video surveillance applications. The new Z-Series IP recorders eliminate the need for purchasing multiple servers, reducing the cost of ownership. Each Z-Series IP NVR records up to 128 IP cameras, includes 8 IP camera licenses and stores up to 120TB of video. Learn more about the exacqVision Z-Series IP recorders. See all the new Z-Series models available. Watch our new video illustrating how the exacqVision video management system (VMS) software integration works with the Sensormatic Anti-Theft electronic article surveillance (EAS) system. The combination of exacqVision and the Sensormatic EAS system gives retailers a unified solution to improve their loss prevention efforts and capture loss event data and video within one interface. Sensormatic EAS systems are designed to help retailers boost their sales and protect their profits by increasing open merchandising opportunities while reducing shoplifting and internal theft. Read more about this integration here.